We've been watching the Tour de France every night for the past couple of weeks. We're currently a day behind (thanks, TiVo! ), due to scheduling conflicts. We just watched the penultimate race: the final time trial in St. Ettienne. My favorite rider, Mickael Rasmussen, a skinny Dane wearing the polka-dotted King of the Mountains jersey, had a horrible day in the final time trials. He was in an unexpected 3rd place coming into the event and was expected to drop a place to Jan Ullrich after the day. The day turned out much worse for poor Rasmussen. After suffering two serious crashes, two flat tires, and three bike changes, he dropped to 7th place. His goal for the Tour de France was to win a stage and to take the King of the Mountains jersey, both of which he did. It still must be hard, though, being in line for a spot on the final podium on the next-to-last day and to instead roll bruised and bleeding across the finish line. 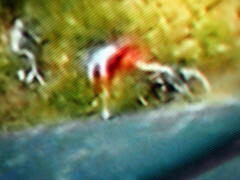 The blurry picture here is from Flickr, apparently a photo of someone's TV as they watch Mickael Rasmussen crash for the second time.